We absolutely loved our stay at this hotel! We actually tried to book at an adjacent hotel but were upgraded to a suite at the Residence Inn as the other hotel was under construction. 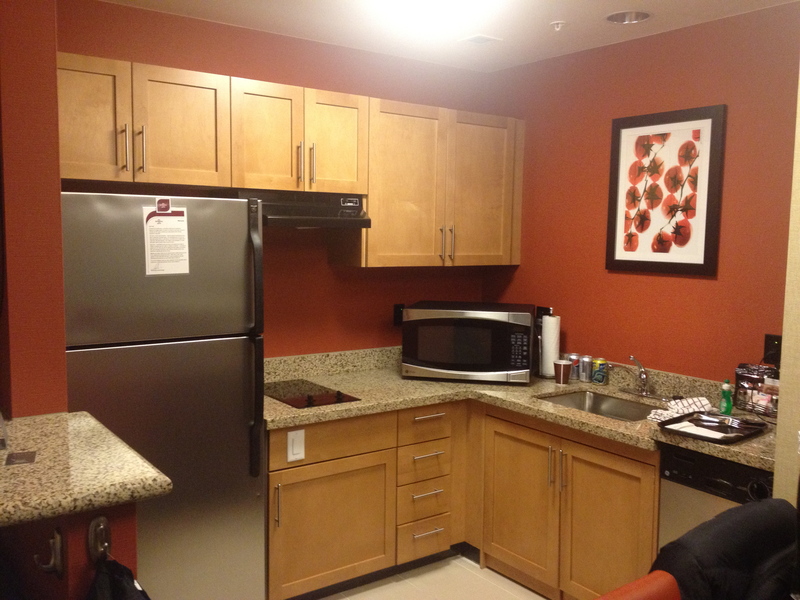 We ended up in a wheelchair accessible suite on the main floor with two bedrooms (one accessible and one not) and two bathrooms (one accessible and one not), a kitchen and a living area. 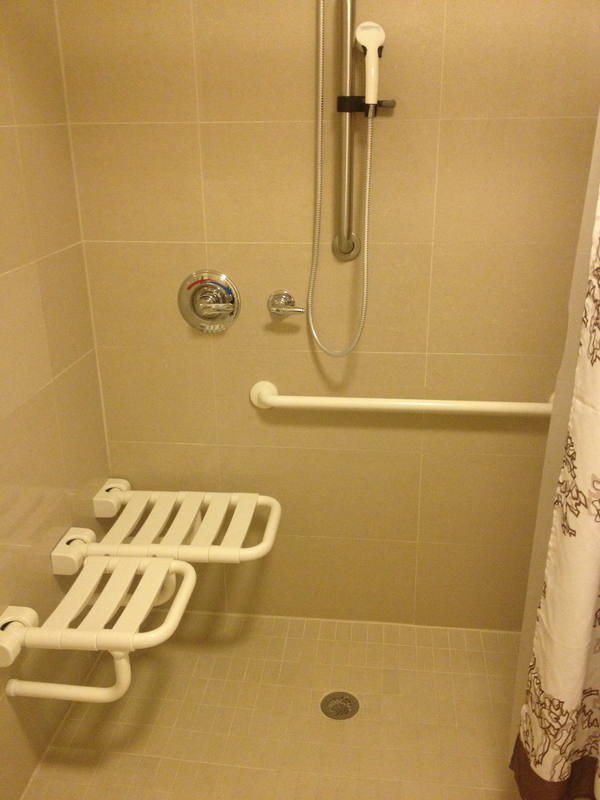 The room we stayed in is absolutely perfect for someone in a wheelchair, complete with a wheel-under sink, wheel-in shower, built-in shower bench, grab bars by the toilet and even a wheel-under sink in the kitchen. The kitchen has a full-sized fridge, dishes, utensils and a dishwasher. It is really well-equipped to make for a very comfortable stay. 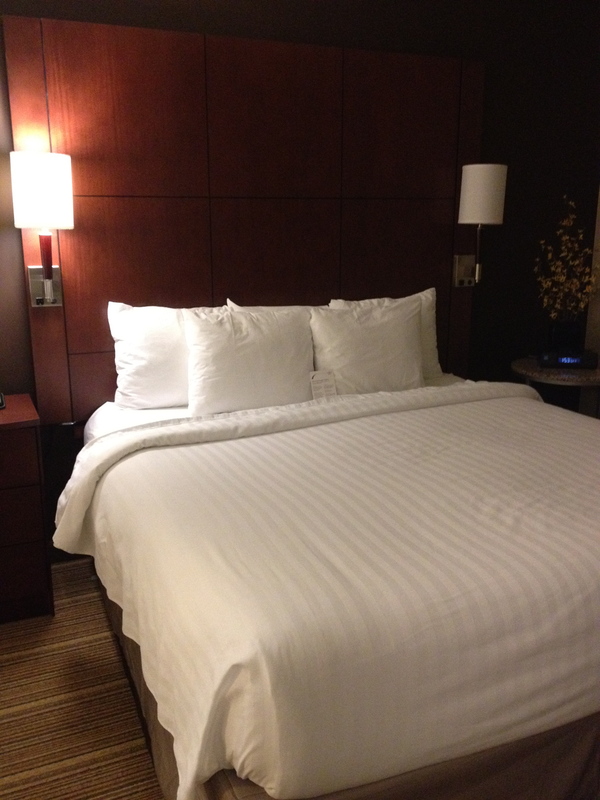 The beds are very comfortable and they are covered in nice clean, white sheets. There are ample comfortable pillows on both beds. 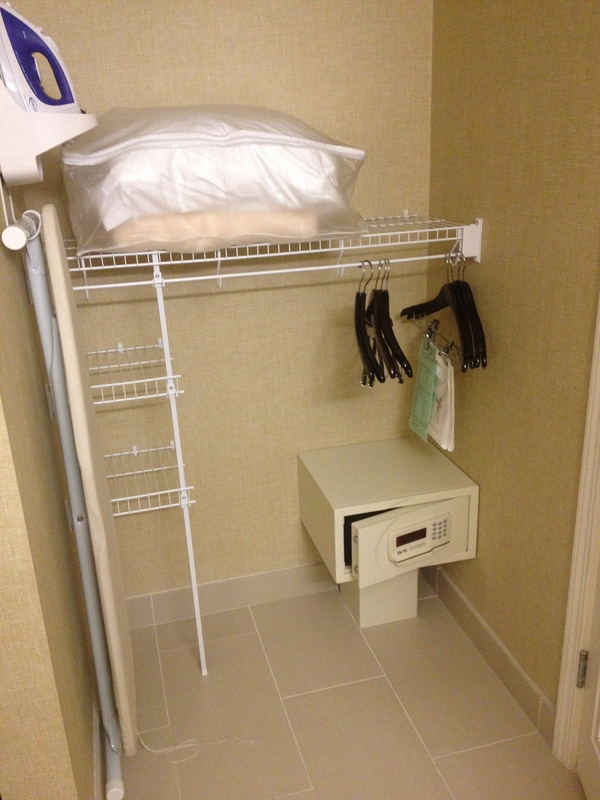 There is a lot of closet space, an iron and ironing board and a free safe in the room. 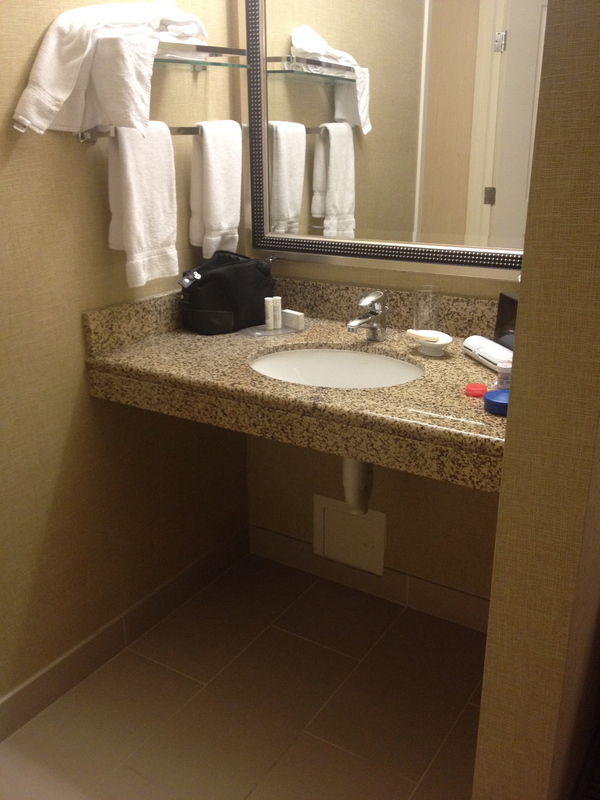 The second bedroom in our suite also had its own bathroom. 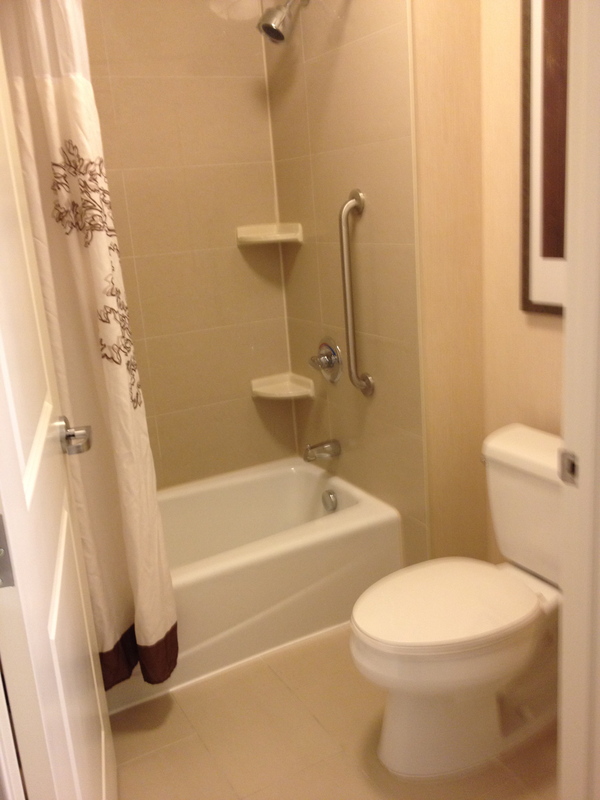 It has a normal toilet and a bathtub with grab bars. I always get very excited when we find a room that has a bathtub as well as an accessible shower as so many accessible rooms have no bathtub. And I love my baths! We stayed at this hotel for one night on our way to Mexico and one night on the way back and the hotel offered us free parking for two weeks! If you have any idea how expensive airport parking is for two weeks, you will recognize this as a huge bonus. The night we arrived, we were surprised to find out that the hotel was hosting a complimentary dinner for all of the guests and the food was great (chicken fingers, salad, potatoes, fruit, etc.). In the morning, the hotel offered a complimentary breakfast (eggs, toast, hash browns, yogurt, cereal, etc.). The staff we encountered at the front desk, the bell staff, the management and the breakfast staff were all extremely pleasant and helpful. The room was very clean and they provided very new looking playpens for the babies to sleep in (all set up when we got there with clean sheets). The airport shuttle was not wheelchair accessible, so the hotel graciously offered to pay for us to take a wheelchair accessible cab to and from the airport. Between the wheelchair, the two babies and all of the luggage we had, we couldn’t all fit into the accessible cab… so the hotel paid for us to take two separate cabs on the way to the airport and on the way back to the hotel when we returned. Seriously. I have never experienced such customer service anywhere else – EVER. Are you kidding me? This place was amazing! I wish I could have stayed at this hotel longer. We had a fantastic experience and, despite not liking to visit the same place twice, I would stay here again in a heartbeat. 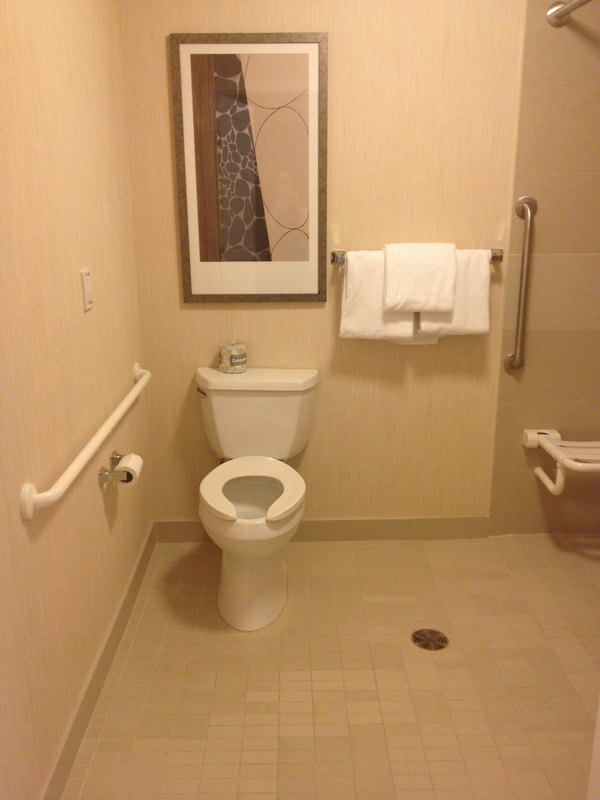 This entry was posted in Alberta, Calgary, Canada and tagged accessibility, Calgary, calgary airport, disability, grab bars, manual wheelchair, paraplegic, residence inn, wheel-in shower, wheel-under sink, wheelchair by papawheelieblog. Bookmark the permalink. Wow, that cab thing is amazing! Sounds like your new go-to place whenever you’re flying out on your way to somewhere exciting. Yeah, it truly was amazing. They were beyond accommodating. I would live at that hotel if I could – that’s how good they were to us!